Brighten Up a Dark Halloween Night! Being safe this halloween while trick-or-treating just got easier! Introducing the Red Cross Mini Lantern! Light up your night with the Multi-Purpose Mini Lantern from the American Red Cross! Designed for those times when you need a safe and portable light source for recreational fun, this compact, water resistant lantern is ideal for use in outdoor family activities like camping, boating, walking or just relaxing with a book in your favorite hammock. 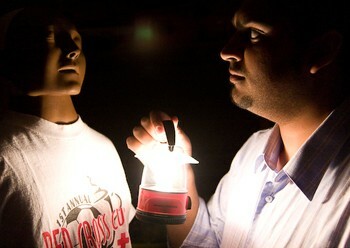 The Multi-Purpose Mini Lantern can be purchased at MyRedCrossStore.org for $7.99 (Normally $8.99). Don’t let the dark scare you, buy a Mini Lantern today! Halloween Leads to Increased chance of Choking! To learn more about CPR, Choking, and sign up online to take a class and save 10%! As we’re all well aware, the economy is not doing as well as we’d like. Many of us are wondering if we should pull out of the market, should we take all our money out of banks, are we going to have a job tomorrow. All valid questions and worth having an answer for! Well I can’t tell you what you should do about money, but what I can say is that this is the best time to strengthen your resume and become an asset for your company. Create job security by acquiring more education and training to help you further your career! You can start with getting certified in CPR/AED and First Aid. Classes start at $52 and if you register online, you save 10%. Are you a business and not sure what the future holds for your company? Did you know that according to OSHA, studies have shown a $4 to $6 return for every dollar invested in health and safety, with improvements in costs associated with absenteeism, Workers’ Compensation claims and productivity. The economy may be tough, but by taking the proper steps and getting trained, you can overcome these tough times. Call Today, (815) 963-8471 or visit our site to find out more about training in the workplace! Well I just finished adding NEW products to MyRedCrossStore.org, and I have to say that I love the power of the internet! Within hours I had orders from South Carolina and Hawaii! If you haven’t checked out our store yet, be sure you do! We’ve got everything you can think of, from Onesies for babies, to Lamps, Cuff Links, T-Shirts, Kits, and so much more! Be sure to visit MyRedCrossStore.org! Additionally, if you would like to learn Compression Only CPR (aka Hands-Only CPR) click here. DID YOU KNOW: We can train you on CPR/AED & First Aid at your House? The title of this post pretty much says it all. We CAN train you in First, CPR/AED at your house, church, backyard, or anywhere else you can find some space. The Red Cross will send out an Instructor, Books, Manikins, and all the supplies you may need. The only thing you need is: A minimum of 8 people and place for us to conduct the class! It’s really that simple! This is a great thing for new mothers and fathers, for church groups, after school organization, or a Club. But the possibilities are truly endless! You are currently browsing the archives for the Rahil – Health & Safety category.